Note: We are uncertain if Bollywood celebrity Pooja Bedi's welcome message to her father's fourth wife is her wicked sense of humour or she was genuinely unhappy about the wedding. But she did manage to fire-up some controversy. Veteran actor, Kabir Bedi married his long-time girlfriend, Parveen Dusanj on January 15, in a private affair with close friends and family. Kabir Bedi's daughter and popular actress Pooja Bedi, from his first marriage with Protima did not attend her dad’s wedding. But she did sent out a welcome message on Twitter. After stirring up a storm with her tweet on the wedding, she later deleted the comment and tweeted again saying she shouldn't have put it up and let's keep positive. Pooja and her father had personal issues but she blames Parveen for aggravating the differences between her and her father. 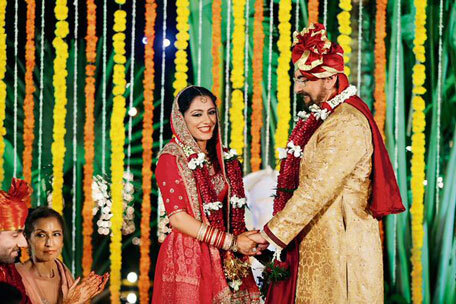 Kabir Bedi, 70, married British-born Parveen, 42, after being in a relationship for 9 years. Before Parveen, Kabir has been married thrice. His first marriage was with the late Protima Bedi. He, then married, the British fashion designer Susan Humphreys. He tied the knot for the third time with TV presenter Nikki Bedi. All his three marriages ended in a divorce.